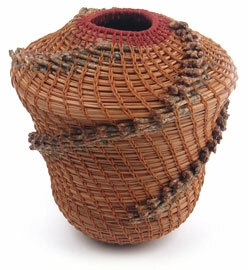 I not only weave very tradition basket forms, which can be seen in the other galleries, I also weave sculptural forms. I use black ash, pine needles, waxed linen, bones, rocks, and leather as well as reed to create these "non-utilitarian" baskets. 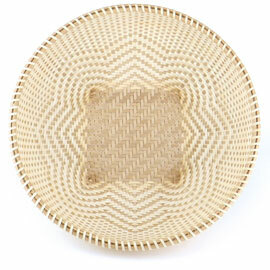 This is a contemporary Nantucket-style basket, designed by Marlys Sowers, is woven of two-toned dyed Hamburg cane with zebra wood base, one-piece rim and lid. Both the staves and the weavers alternate between black and tan and create a interesting spiral pattern up the sides of the basket. 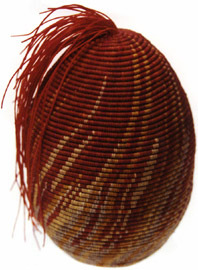 Instead of using a temporary mold to make this basket, it is woven over a plastic vase, which remains in the basket to act as a liner. This is a traditional Nantucket-style basket with a twist, or a wave as the case may be. 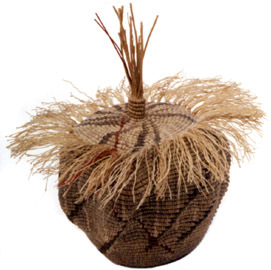 The basket, designed by Marlys Sowers, is woven of cane over cane with a walnut base, one-piece rim and lid, but with an extra overlay of color-coordinated waxed linen. This is a contemporary twist on a traditional Shaker quadrafoil pattern by JoAnn Kelly Catsos. Unlike the Shaker cloverleaf design, this one features eight lobes or petals. 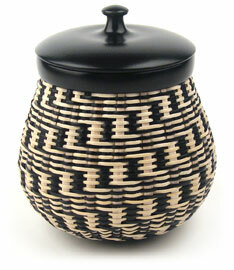 The basket is woven of black ash using light sapwood weavers and darker heartwood uprights to accentuate the pattern. 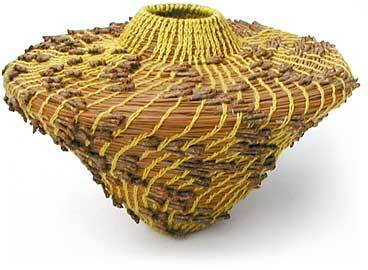 This is a coiled pine needle basket stitched with waxed linen thread. I left the tips on the long leaf pine needles as a design element. I collected these needles on one of my trips to North Carolina. 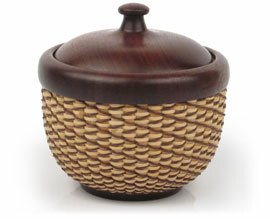 This is coiled pine needle basket stitched with silk loom weaving yarn. I left the tips on the pine needles and let them fall in a random pattern up the sides of the basket. 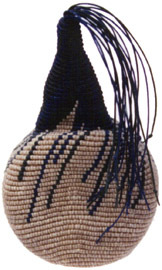 This basket, designed by Marlys Sowers, was woven over a puzzle mold. It features black and white staves and weavers forming a dynamic pattern spiraling up the sides of the basket. The base, solid rim and lid are all ebonized oak using india ink. This is the second knotted basket I made. I started this basket after taking a workshop given by Jane Sauer, a world-renowned fiber artist who specializes in knotted vessels. Jane is from St. Louis, MO and I recently went to a gallery opening of her work. Her pieces go for 10's of thousand dollars and all but one in this recent collection was already sold. While this basket is only 6 inches tall, including the tassel, it took me a good month to complete and that was working on it almost every day. I started this basket not long after finishing the basket above. You can see the basket in progress below with another I was working on at the same time. I finished this basket 3 years later just in time to have it my graduate show. My classmates all thought it looked like a "Dr. Seuss tree". I started this basket one summer to have something to work on while I was working on my tan. I didn't get very far on either. I estimated that it took me at least an hour to complete one row around the basket. I was very pleased with the way this basket turned out. I have always wanted to title it something like "the birth of fire". I completed this basket in the shortest amount of time of all the knotted baskets I have made and yes it is the smallest. Unfortunately in this photo you can't see the dark green and navy that spiral toward the top of the basket. Like the other knotted baskets I have make I keep it under a glass dome. Dust is the worst enemy to fibers. This basket was started in the spring following the start of the second basket featured here. In the photo on the right you can see the basket from the side. I use a styrofoam cone carved into this shape to aid in the "weaving" of the basket. After the I worked up to a certain point on the form I dug out the styrofoam with a spoon. The knots are so tight that the basket is completely rigid. The basket featured was not completed for 8 years! Basket coiled of pine needles and stitched with wool yarn. This is one of the first coiled baskets I made and I quickly fell in love with this technique. Since I work with the needles dry and use a tightly plied spool of yarn, like the knotted baskets, I can easily transport and work on one of these when I travel. I use what is called a "warp" yarn, which is used in loom weaving, because it is very strong and can resist the wear of being pulled through the pine needles repeatedly. I really like using yarn to stitch with because I can get it in almost any color that I want and I like the contrast to the natural needles.